Sea level rise acceleration (or not): Part III – 19th & 20th century observations | Climate Etc. Part II provided an overview of the relatively recent geological evidence for sea level variations. Part III considers the historical observations for sea level rise in the 19th and 20th centuries, focusing on an evaluation of conclusions in the IPCC AR4 and AR5 in the context of recent research. Tide gauges measure the variations of sea level relative to a geodetic benchmark, a fixed point of known elevation above mean sea level. Some tide gauge records extend back to the eighteenth century. Reconstruction of global sea levels since the late 1800s (until the satellite era beginning in 1993) relies uniquely on the tide gauge record. To reconstruct equilibrium sea level changes from tide gauges, account must be made of vertical shifts of the land, caused by geological processes or land use (e.g. ground water extraction). To improve scientific utility for sea level studies, numerous modern tide gauges are being augmented with automated, continuous GPS measuring instruments which records vertical land movements. Further, account must be made of non-eustatic dynamic changes in sea level due to tides, storm surges, tsunamis and large-scale ocean currents. Further, tide gauge technology has changed over time. Simple wooden staffs have evolved into higly sophisticated digital equipment — it is likely that the results from different equipment might not agree with each other. A wooden staff is not going to measure with the same degree of accuracy-or under the same circumstances as a digital equipment. Tide gauges have the following disadvantages for determining global sea level changes: uneven distribution around the world; missing data; spatial and temporal variations in ocean circulations; and land movements. Because of these disadvantages, calculating global mean sea level rise from the limited tide gauge network has proven to be difficult. Although considerable progress has been made, further improvements to the historical record are still needed, particularly in accounting for ocean circulation changes. A complementary method for determining and/or evaluating global sea level rise is a budget analysis that adds together the cumulative effect of the main contributors to sea level rise: thermal expansion, melting of ice in glaciers, ice loss from the Greenland and the Antarctic ice sheets, and changes in land water storage. If the budget analysis matches the tide guage analysis, then the sea level budget is closed. Any mismatch provides an estimate of the uncertainty of the estimates of sea level change. A major source of uncertainty rests in the methodology of determining trends (velocity) and acceleration from the tide gauge records of sea level. In particular, trends determined via simple linear regression and acceleration determined through simple quadratic fits are extremely limited and likely to be unduly influenced by the particular time slice. Visser et al. (2015) reviewed the different trend models applied to sea level data to assess sea level rise and its acceleration-deceleration. They reviewed 30 methods, each having its individual mathematical formulation, flexibilities, and characteristics. They found that just by choosing a different model, one can find decelerations where another trend model shows a linear or even accelerating pattern. They conclude that uncertainties should be taken into account to prevent biased or wrong conclusions and that removing internally generated climate variability by incorporating atmospheric or oceanographic information helps to uncover externally forced climate change signals. No scientific consensus has been reached yet as to how a possible acceleration could be separated from intrinsic climate variability in sea level records. A recent Ph.D thesis by Phil Watson of the University of New South Wales (LINK) developed improved techniques to estimate mean sea level velocity and acceleration from long ocean water level time series. This task involved extensive time series analysis that identified Singular Spectrum Analysis (SSA) as an optimal analytic for resolving estimates of mean sea level from long tide gauge records with improved accuracy and temporal resolution, since it provides a superior capability to separate key time varying harmonic components of the time series. 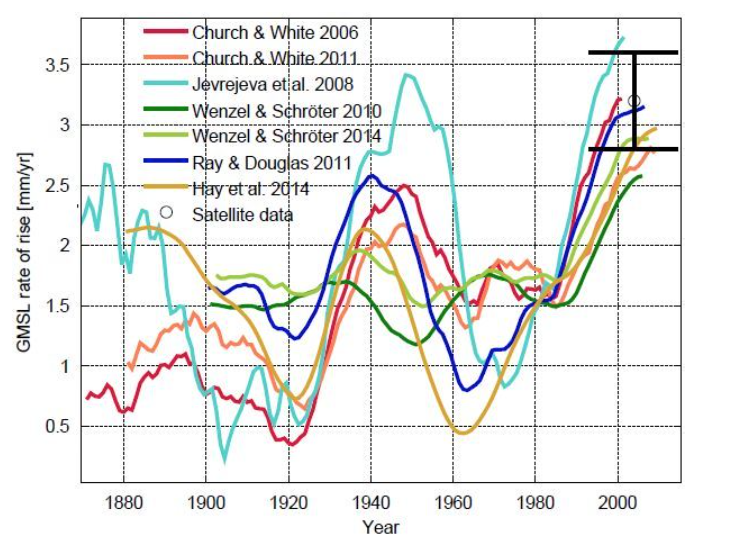 Has sea level rise accelerated since the 19th century? Part II examined the century-to millennial scale sea level record. Both Kopp et al. (2016) and Grinsted et al. (2009) found the lowering sea levels of the Little Ice Age reversed to rising sea levels around 1800, although those datasets have coarse resolution. Global mean sea level (GMSL) has risen about 8 inches during the 20th century, although we will see in the next section there is significant uncertainty surrounding this number. Part of the argument for an impact of human caused warming on sea level rise (SLR) is an acceleration in the rate of SLR since the 19th century. AR4 concluded that there was “high confidence that the rate of global sea level rise increased from the 19th to the 20th century” but could not be certain as to whether the higher rate since 1993 was reflective of decadal variability or a further increase in the longer-term trend. It has been clear for some time that there was a significant increase in the rate of sea level rise in the four oldest records from Northern Europe starting in the early to mid-19th century. The results are consistent and indicate a significant acceleration that started in the early to mid-19th century (Woodworth 1990, 1999), although some have argued it may have started in the late 1700s. The increase in the rate of sea level rise at Stockholm (the longest record that extends past 1900) has been based on differencing 100-year trends from 1774–1884 and 1885–1985. The estimated change is 1.0 [0.7 to 1.3] mm yr–1 per century (calculated by Woodworth 1990). In general, no evidence was found for MSL accelerations significantly different from zero over the period 1870 to the present, although non-zero accelerations were observed at individual stations. In order to extend the study to time-scales longer than a century, data from the oldest European MSL records at Brest, Sheerness, Amsterdam and Stockholm starting in 1807, 1834, 1700 and 1774, respectively, were also investigated with the result that a positive acceleration of order 0·4 (mm year−1) per century appears to be typical of European Atlantic coast and Baltic MSL over the last few centuries. A recent paper by Phil Watson (2017) has assessed sea level rise and its acceleration from European tide guage data, using the singular spectrum analysis approach. Watson examined the four longest European records (Amsterdam, Netherlands, 246 yrs; Stockholm, Sweden, 214 yrs; Brest, France, 208 yrs; and Swinoujscie, Poland, 202 yrs). The analysis showed velocities and accelerations that vary over time and that that relative velocity is steadily increased over time, peaking at or near the recent end of the time series record. For each of the 4 records, the acceleration is predominantly confined to a narrow band within ±0.05 mm/year2 and not statistically different from zero at the 95% confidence level for most of the records, despite evidence that relative velocities are continuing to increase. Consideration of the entire European tide guage dataset with records at least 80 years long (83 total stations) shows a broad pattern of acceleration centered in bands around 1880 to 1910, 1940, and 1976 and a strong spatially coherent signal between 1994 and 2000. Watson concluded that at the 95% confidence level, that there is no consistent or compelling evidence (yet) that recent rates of rise are higher or abnormal in the context of the historical records available across Europe. Watson states that it is likely a further 20 years of data will distinguish whether recent increases are evidence of the onset of climate change–induced acceleration. A challenge with the long time series methods is not only changes in measuring technology, but the gauge is rarely continuously located in the same place. The Brest tide gauge has moved several times, with the last move occurring after it was destroyed by Allied bombing in 1944 when it was dormant for some 10 years. 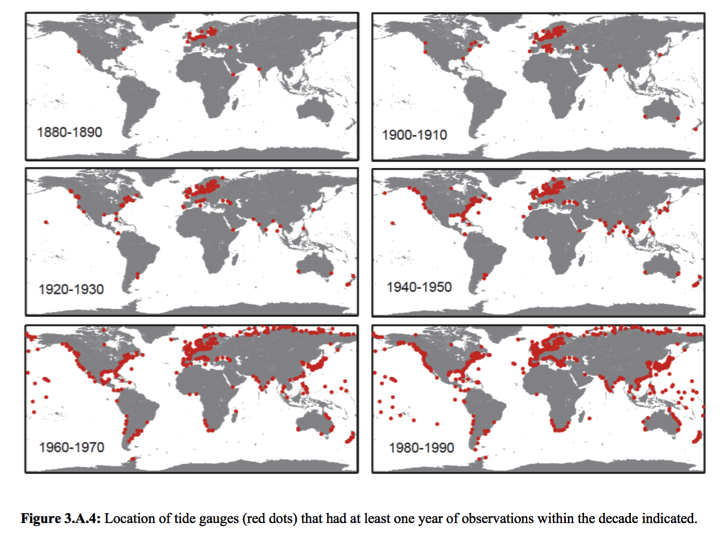 Tide gauges with the longest nearly continuous records of sea level show increasing sea level over the 20th century. There are, however, significant interannual and decadal-scale fluctuations about the average rate of sea level rise in all records. Different approaches have been used to compute the mean rate of 20th century global mean sea level (GMSL) rise from the available tide gauge data: computing average rates from only very long, nearly continuous records; using more numerous but shorter records and filters to separate nonlinear trends from decadal-scale quasi-periodic variability; neural network methods; computing regional sea level for specific basins then averaging; or projecting tide gauge records onto empirical orthogonal functions (EOFs) computed from modern altimetry or EOFs from ocean models. Different approaches show very similar long-term trends, but noticeably different interannual and decadal-scale variability. The rate from 1901 to 2010 is 1.7 [1.5 to 1.9] mm yr-1, which is unchanged from the value in AR4. Rates computed using alternative approaches over the longest common interval (1900–2003) agree with this estimate within the uncertainty. A translation of these rates into inches per century: 1.9 mm yr-1 equals 7.5 inches; 1.5 mm yr-1 equals 6 inches; 1.1 mm yr-1 equals 4 inches. While there is some difference in these numbers associated with ending the period in 1990 or 1999, the major discrepancies relate to tide guage selections, vertical land motion corrections, area weighting and statistical analysis methods. The important point here is that recently published rates of SLR of 1.1 and 1.2 mm yr-1 are outside of the very likely confidence interval in the IPCC AR5. The very substantial differences in estimated rates of 20th century sea level rise, plus the confounding factor of internal variability, have significant implications for attribution analyses and also for projections of 21st century sea level rise.
. . . the historic rise started too early, has too linear a trend, and is too large. Melting of polar ice sheets at the upper limit of the Intergovernmental Panel on Climate Change estimates could close the gap, but severe limits are imposed by the observed perturbations in Earth rotation. Among possible resolutions of the enigma are: a substantial reduction from traditional estimates of 1.5–2 mm/y global sea level rise; a substantial increase in the estimates of 20th century ocean heat storage; and a substantial change in the interpretation of the astronomic record. The issue of the sea level rise budget as a constraint on uncertainty in the tide guage assessments of sea level rise received little mention in AR4 or AR5. Further, the Munk (2002) paper on the enigma of the twentieth century sea level rise was not cited in either the AR4 or AR5. Table 13.1 in the AR5 finds a global mean sea level rise budget imbalance of 0.5 [0.1 to 1.0] mm yr-1 for the period 1900-1990. The AR5 concluded that the observational sea level budget cannot be rigorously assessed for 1901–1990, due to insufficient observational information to estimate ice sheet contributions with high confidence before the 1990s; in addition ocean data sampling is too sparse to permit an estimate of global-mean thermal expansion before the 1970s. Since publication of the AR5, the topic of balancing the budget of sea level rise during the period 1900-1990 has been the subject of several papers (note: the SLR balance is much more straightforward in the satellite era since 1993, which is the subject of Part IV). Jevrejeva et al. (2016) have prepared a review article on the 20th century sea level budget, clarifying the outstanding issues. Gregory et al. (2013) published an overview of estimates of individual sea level contributions over the twentieth century. The range of possible sea levels obtained by combining all individual estimates in various combinations (total 144 combinations) suggested that the observed sea levels lie at the very edge of the range and a residual trend is needed to make up for the discrepancy, selecting the largest or smallest estimates for individual contributors. Gregory et al. concluded that if the residual trend can be interpreted as a long-term Antarctic contribution, the budget can be satisfactorily closed. Hay et al. (2015) argue that rates of sea level rise between 1.0 and 1.4 mm yr-1 close the sea-level budget for 1901–1990 as estimated in AR5, without appealing to an underestimation of individual contributions from ocean thermal expansion, glacier melting, or ice sheet mass balance. In summary: Values of GMSL on the lower end (e.g. 1.1 or 1.2 mm yr-1) come closest to balancing sea level budgets for the period 1900 — 1990. These relatively low values of GMSL are well outside the AR5 very likely range of 1.5 ± 0.2 mm yr-1 for the same period. Assessing the impact of internal variability in ocean circulations on global and regional sea level rise is essential for detecting and attributing sea level rise to human caused climate change and predicting future change, including any acceleration in SLR that can be attributed to humans. Separating the effects of natural climate modes and anthropogenic forcing, however, remains a challenge and requires identification of the imprint of specific climate modes in observed sea level change patterns. A long time-scale is needed because significant multidecadal variability appears in numerous tide gauge records during the 20th century. 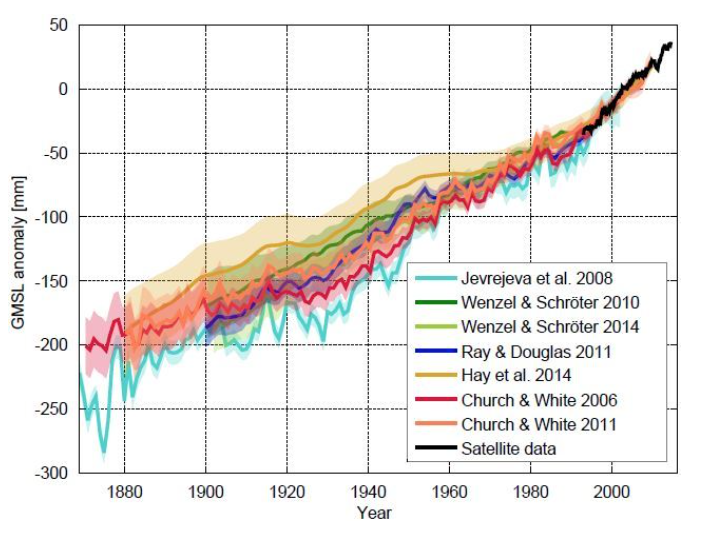 The multidecadal variability is marked by an increasing trend starting in 1910–1920, a downward trend (i.e., leveling of sea level if a long-term trend is not removed) starting around 1950, and an increasing trend starting around 1980. Although the calculations of 18-year rates of GMSL rise based on the different reconstruction methods disagree by as much as 2 mm mm yr-1 before 1950 and on details of the variability (Figure 3.14), all do indicate 18-year trends that were significantly higher than the 20th century average at certain times (1920–1950, 1990–present) and lower at other periods (1910–1920, 1955– 1980), likely related to multidecadal variability. The IPCC AR5 found that it is likely that a sea level rise rate comparable to that since 1993 occurred between 1920 and 1950. Hay et al. (2015) find that average rates of sea level rise (15 year averages) circa 1940 were of comparable magnitude to values at the end of the 20th century. Hamlington and Thompson (2015) identified the negative rates of sea level rise during the 1950’s in the Hay et al. analysis as primarily associated with inclusion of high latitude tide gauges. All of the analyses find a mid century peak in the rate of sea level rise, although most of the analyses find the current peak to be higher. The mid century peak in sea level rise is believed to be associated with multi-decadal internal variability. A recent paper by Han et al. (2016) reviews our current state of knowledge about spatial patterns of sea level variability associated with natural climate modes on interannual-to-multidecadal timescales. Over the Pacific Ocean, the PDO and NPGO are the two dominant climate modes and they are associated with global signatures and distinct spatial patterns of sea level changes. Over the Indian Ocean, sea level trend patterns since the 1960s are driven primarily by surface winds. On decadal timescales, wind stress associated with ENSO and IOD is the major cause for decadal sea level variability north of 20°S. Over the Atlantic, the NAO-associated sea level patterns exhibit a dipole structure in the North Atlantic basin. The upward trend of the AMO SST index during recent decades coincides with the observed accelerated SLR along the US northeast coast. Over the Arctic, significant correlations between the AO index and tide gauge records have been found, but with distinct regional variations. Finally, the SAM can have a significant influence on sea level in the Southern Indian and Pacific Oceans. Zonal asymmetry in SAM-associated winds might have contributed to the asymmetry of decadal sea level variations in the southern ocean during most of the twentieth century. The short records of available datasets limit our ability to detect the full character of decadal climate variability. Modeling studies suggest that we need ~500 years of observations to sample the full range of ENSO decadal variability (e.g., Wittenberg 2009). We find that there is a significant oscillation with a period around 60-years in the majority of the tide gauges examined during the 20th Century, and that it appears in every ocean basin. Averaging of tide gauges over regions shows that the phase and amplitude of the fluctuations are similar in the North Atlantic, western North Pacific, and Indian Oceans, while the signal is shifted by 10 years in the western South Pacific. The only sampled region with no apparent 60-year fluctuation is the Central/Eastern North Pacific. The phase of the 60-year oscillation found in the tide gauge records is such that sea level in the North Atlantic, western North Pacific, Indian Ocean, and western South Pacific has been increasing since 1985–1990. Although the tide gauge data are still too limited, both in time and space, to determine conclusively that there is a 60-year oscillation in GMSL, the possibility should be considered when attempting to interpret the acceleration in the rate of global and regional mean sea level rise. Around the beginning of 19th century, sea levels began to rise, after several centuries associated with cooling and sea level decline. There are only a few historical tide guage records that extend back to 1800, with several along European coasts. Improved time series analysis methods do not support the statistical significance and likelihood levels of the IPCC’s conclusion that sea level rise has accelerated in the 20th century relative to the 19th century. Recent analyses of 20th century sea level rise find significantly lower values than were cited in the IPCC AR4 and AR5. These lower values between 1900-1990 are more consistent with integral constraints from mass budget analyses. These lower rates of sea level rise have major implications for the assessment of sea level rise and its acceleration in the satellite era since 1993 and also for the baseline scenario of 21st century sea level rise. There is substantial multi-decadal internal variability in the sea level change record, including an apparent ~60 year oscillation. This variability confounds analyses of sea level rise acceleration and attribution to human caused climate change. In view of the multiple modes and periods of internal variability in the ocean, it is likely that we have not detected the full scale of internal variability effects on regional and global sea level change. In contrast, before the altimetry era, direct estimates of GMSL changes rely on the coastal network of tide gauges that provide in situ observations of sea level relative to the land. 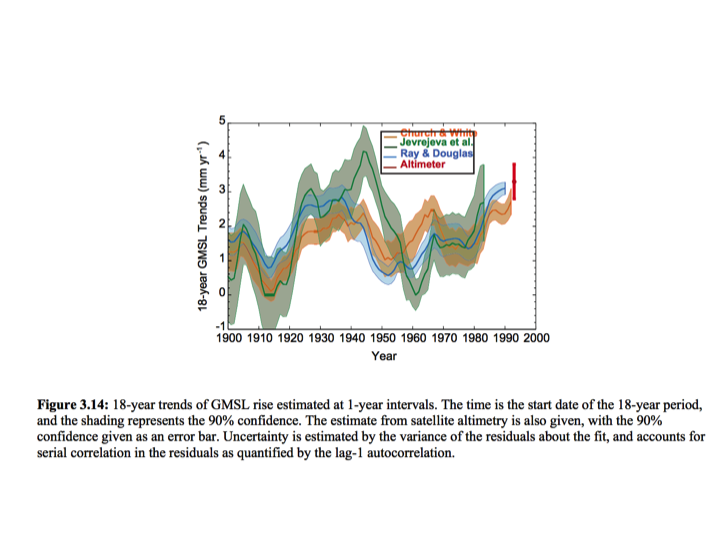 These long‐term sea level observations show that GMSL rose slower during the 20th century. Depending on how tide gauge records are combined, rates range between 1.3 and 2.0 mm/year with uncertainties that have been estimated at about an order of magnitude smaller. The differences in rates at multi‐decadal and centennial time scales between the various reconstructions are likely to arise from: (i) the selection of the tide gauge stations; (ii) the corrections (or lack of) of the VLM of the Earth’s crust and of the geoid deformations induced by mass load changes that affect local tide gauge locations ; (iii) the methodologies used to merge a limited number of tide gauge stations or proxy records into a GMSL series; and (iv) the limited ability of all methods to separate the externally‐forced long‐term changes from the low‐frequency fluctuations associated with internal climate variations. However, a complete understanding of the relative importance of each of those factors is lacking. This severely limits our ability to provide a unique estimate of GMSL change at century to millennial time scales and thus restrict the historical interpretation of the altimetric GMSL record. There is high confidence that the rate of sea level rise has increased between the mid-19th and the mid-20th centuries. This conclusion is based on an extremely small amount of data, neglect of the role of internal variability, and a highly simplified analysis method. Watson finds no statistically significant acceleration in the long time series European tide gauges. The AR4’s ‘high confidence’ is completely unjustified. It is virtually certain that globally averaged sea level has risen over the 20th century. In this case, virtually certain is defensible. [SLR]with a very likely mean rate between 1900 and 2010 of 1.7 [1.5 to 1.9] mm yr-1. Recent estimates of SLR over this period of 1.1 to 1.2 mm/yr, that better align with integral constraints, are substantially lower that the AR5 values, make a mockery of the very likely likelihood. Taking several published estimates that show some sort of general agreement to produce a very likely conclusion, while ignoring the very substantial uncertainties in these estimates, should not form the basis for a very likely conclusion. It is likely that sea level rise throughout the Northern Hemisphere has also accelerated since 1850. They consider three estimates, with two showing acceleration and the third showing none. This does not justify likely (>66%), especially given the very sparse data and the unknowns surrounding multi-decadal and longer ocean oscillations. Given the available information, a likelihood of more likely than not would be the appropriate conclusion. Given the uncertainties, as likely as not would be appropriate. Very simply, the IPCC authors weigh the existing evidence and make their conclusions based on this information. They ignore the space of missing, ambiguous and uncertain information in their likelihood assessments. As a result, we see that some ‘very likely’ and ‘likely’ conclusions from the AR4 and AR5 that are ‘very likely’ to be overturned by the AR6. Part IV (forthcoming): Sea level variations in the satellite era. This Part will address the insights and challenges of global sea level from satellites, including interpretation of the sea level record since 1993, SLR acceleration and arguments for and against detection of human-caused sea level rise. This entry was posted in Data and observations, Oceans. Bookmark the permalink. A typo in your discussion of Watson (2017). You wrote, “For each of the 4 records, the acceleration is predominantly confined to a narrow band within 60.05 mm/year2”. Watson’s text has “±0.05 mm/y2” instead. So what? The IPCC doesn’t do science. Scientists do it. It often moves on. The enigma has been solved by 1.2 mm Mitrovica et al: including 1.2 mm Hay and 1.2 mm Kopp. Still waiting for the acceleration. The problem with the relatively short satellite record (even if we assume there is little uncertainty in the measured sea level) is that the record is influenced significantly by ENSO as well as other relatively short term and long term effects. The data you link from NASA does actually show modest acceleration from 1992 to present (~0.048 mm/yr^2), but it is not clear if that acceleration is due entirely or partially to sea level changes not driven by thermal expansion and melting of land supported ice. A reasonable first step would be removal of the estimated ENSO influence and testing again for acceleration in the trend. My guess: most of the acceleration will disappear once ENSO is accounted for. Global mean sea level (GMSL) over the twentieth century has been estimated using techniques that include regional averaging of sparse tide gauge observations, combining satellite altimetry observations with tide gauge records in empirical orthogonal function (EOF) analyses, and most recently the Bayesian approaches of Kalman smoothing (KS) and Gaussian process regression (GPR). Estimated trends in GMSL over 1901–90 obtained using the Bayesian techniques are 1.1–1.2 mm yr−1, approximately 20% lower than previous estimates. It has been suggested that the adoption of a less restrictive subset of records biased the Bayesian-derived estimates. In this study, different subsets of records are used to demonstrate that GMSL estimates based on the Bayesian methodologies are robust to tide gauge selection. A method for determining the resolvability of individual sea level components estimated in a Bayesian framework is also presented and applied. It is found that the incomplete tide gauge observations result in posterior correlations between individual sea level contributions, making robust separation of the individual components impossible. However, various weighted sums of these components, as well as the total sum (i.e., GMSL), are resolvable. Finally, the KS and GPR methodologies allow for the simultaneous estimation of sea level at sites with and without observations. The first KS and GPR global maps of sea level change over the twentieth century are presented. These maps provide new estimates of twentieth-century sea level in data-sparse regions. Thanks for spotting this article. Another typo — “Guage” should read “gauge”. Just pointing out that the AR5 estimate for 1900-1990 was 1.5 ± 0.2 mm yr-1 and the three later estimates for that time range overlap significantly with it. 1.3-1.4 mm/yr is within all their error bars. Is not the general ‘consensus’ that there is really no observable – potentially measurable human footprint on GW until somewhere between 1950 and the mid to late 1970’s; the period in which the rise in AGHG’s really took off? The first problem is that the gauge is rarely continuous in the SAME place. Brest is a case in point. It has moved several times. The last time after it was destroyed by Allied bombing in 1944 when it was dormant for some 10 years. Which leads us to the next problem, which is that simple wooden staffs have evolved into highly sophisticated digital equipment. The change over to satellite observations when an apple is being compared to a pineapple further complicates the issue. Those unable to read a French menu can click on the language icon and find out lots of interesting information on Brest in particular and measuring sea levels generally. No one anywhere can see any rapid acceleration, except in those places which has always experienced it, but conversely many places have seen sea levels fall. Of course it is very reasonable to expect that the vast amounts of water locked up as ice in the LIA is now melting. We had a high water stand around 1600 and should expect another one during the latest warming period. When that will peak and how fast the rise will be is the question of course. Sea level rise or fall problem can be treated either like a problem of physics or like one of mathematics. Physics tells us that the sea level can be influenced by a melting/accumulation of ice caps and glaciers, as well as a thermal expansion of ocean water. Unfortunately we lack reliable historical data for either mechanism. In the short term, winds, tides and waves also play a role. Mathematically, the problem becomes an estimation of trends from noisy historical data. The presence of a long-term component suggests that the noise is a red noise, not a white noise. We can employ a number of tricks like finding a periodic component of a signal. You can find all kinds of periods in a noise – none of them statistically significant, but you can include them in your analysis to support any type of a desired result. That is not a honest analysis. In politics these methods are known as “creative accounting”. In pseudo-science they are known as novel statistical methods. The bottom line is that it is difficult enough to extract the first derivative (the rate of sea level rise) from data. Methods to extract the second derivative (the sea level rise acceleration) fall under creative accounting. Indeed, none of the published papers on sea-level rise utilize a mathematically consistent, empirically proven metric for even the first derivative of sea level, let alone the second. They are ad hoc, improvised measures that assume, rather than discover, some spectral form or another for the underlying sea-level signal. The presence of a long-term component suggests that the noise is a red noise, not a white noise. While white noise is certainly not what interferes with our perception of long-term sea-level variations, uncritical reliance upon simplistic red noise models blinds us to the far-more-structured components that seem to manifest themselves in the best tide-gauge records and in the most reliable paleo reconstructions of sea-level. These largely unidentified, quasi-periodic components render highly tenuous all estimates of secular trend, let alone its changes. This was mentioned one time. Will there be more on this topic? Closing the budget is a worth-while exercise, but has its own traps. eg, manipulating the tide gauge analysis until it meets the sum of the main contributors will cement in place any errors or omissions in the main contributors. There may well be errors, but there are certainly omissions: continental movements, and land erosion, for example. And do we know for sure that temperature or chemical changes in Earth’s core don’t make another millimetre or two of difference? Short records of sea level measurements by the Ordnance Survey at 31 locations in 1859–1860, together with recent Mean Sea Level (MSL) information from the UK tide gauge network, have been used to estimate the average rates of sea level change around the coast of Great Britain since the mid-19th century. Rates are found to be approximately 1 mm yr−1 in excess of those expected for the present day based on geological information, providing evidence for a climate-change related component of the increase in UK sea level. In turn, the rates of change of MSL for the past 60 yr are estimated to be ∼1 mm yr−1 in excess of the long-term rates since 1859, suggesting an acceleration in the rate of sea level rise between the 19th and 20th/21st centuries. Although the historical records are very short (approximately a fortnight), this exercise in ‘data archaeology’ shows how valuable to research even the shortest records can be, as long as the measurements were made by competent people and the datums of the measurements were fully documented. JCH – There appears to be an error in the Summary that you cite. Where it says “shows how valuable to research even the shortest records can be, as long as the measurements were made by competent people and the datums of the measurements were fully documented” it should say “shows how valuable to research even the shortest records can be, as long as they agree with preconceptions”. The idea that “(approximately a fortnight)” of data from 1859 or 1860 can legitimately be used in this way is absurd. Judith – I suggest you drop the link again. Do you really think that the data could have been used if it had shown that recent rates of change were not in excess of the long-term rates? It would have been laughed out of court. The use of the year 1859 in that study cited by jch enables us to note that Brunel died in that year. In order to convert the gauge of the line, Brunel had built a stone harbour a mile from teignmouth around 1845 to bring in barges, railway material and to house thousands of navvies. I saw a recent article that showed the islands of Tuvalu are generally expanding over the past 4 decades or so, due to the shifting sands. So the alarmists will have to look for another posterchild for the horrors of sea level rise. Please keep in mind that the Amsterdam tide gauge, while being the world’s oldest, ended it’s its reliability in the 1930s when the Afsluitdijk (closing dike) sealed off the Zuider Zee and Amsterdam Harbor, along with the locks on the North Sea Canal. The gauge is still visible for tourists to see, but useless for any reliable measurement in the current day. Alternatively, the tide gauge at Nyborg, Denmark, and its harbor, Slipshavn, are situated in a techtonically inert zone, where ground is neither rising nor subsiding, and records a continuous 130 year unchanging linear rise of 1.1mm/yr. Other factors (gravitational, currents, etc.) influence it, but it is likely one of the best to “gauge” whats going on in Northern Europe! I can’t get past the zeta of Munk on 20th century SLR. SLR(total) – SLR(ocean warming) – SLR(ocean mass) = 21 – 3 – 6 = 12 cm unaccounted for. The PDF linked and the PNAS html versions are different. The former suggests that the unaccounted for difference is 21cm. There is an anthropogenic warming – I make it to be about 0.4K all things considered. The residual is natural and about to be lost this century. The associated SLR seems benign enough – but the entire Earth system is nonlinear. Looking for 120mm in a century? I think it might just be a study past its use by date – think data sources – and not so much a justification for climate rhetoric. Increasing since 1985–1990 with a 60-year oscillation means we all get together sometime during 2045-2050 to watch it start rising again from a level lower than it is today? The statement is for acceleration in sea level rise regardless of sparse data and other unknowns and available data. Percentage is therefore 66.666 recurring. Which easily qualifies it for the rating of likely by 2/3rds of 1 percent. It qualifies by definition, though not by commonsense. An example of running data models til you find a pattern? Since data has been available for < 200 years it would be hard to find oscillations of 100 years or more, just not enough room to fit in. Oscillations of a few years would just not stand up to the natural variation sloshing patterns caused by the winds, see known sea level changes during El Niño etc. The only hope of a periodic signal is in the 10 to 60 year range and what do we get? No mention of the other oscillations they would have found but that they could not tie into a patttern. A pattern that is not uniform in time, sad about that 10 year gap, place or volume. Plus the elephants in the room, what cause is being linked to the unusual property of water to expand or contract over 60 years without a known input. We cannot blame currents. There is no concurrent 60 year cyclical temperature rise and fall that fits. We cannot blame 60 year ice melt events or precipitation events. Not even astronomy or CO2. Finding patterns and augury in water expansion and contraction is a lot different to finding patterns in waves, winds and currents which have putative if hard to model causes. Is there a 60-year oscillation in global mean sea level? Nerem acknowledges the contributions Merrifield made to his acceleration paper, so two of the 60-year guys are in the acceleration paper. The problem with Climate Change is that there is no integrity in the data. Therefore you have to find objective measures to make the case. You can’t see a global temperature, but you can easily see the watermarks from sea level. If in fact temperatures are warming at an increasing rate, glaciers should be melting at an increasing rate, and as a result, sea levels should be increasing at an increasing rate. In other words, the objective measure of sea level increase isn’t validating the subjective measures of global temperatures. To a real scientist, that is a smoking gun as to the temperature adjustment fraud. Satellite data also doesn’t validate the ground measurements. A general comment. The AGW argument is not about the rate (velocity) of sea level rise, but rather whether it is accelerating. This question gets coupled to GAST, amd is made difficult by the requirement for at least 60 year tide gauge records to determine rate because of decadal variability such as the lunar 18.6 year inclination cycle. Generally, GAST did not increase 1950-1975, did 1975-2000, and except for the now cooled 2015-16 El Nino blip, hasn’t since. No meaningful AGW until after 1950 (AR4 WG1 SPM fig 4). Just long enough to determine rate. Not long enough to determine acceleration/deceleration or coupling to GAST. So the SLR acceleration hypothesis is not yet observationally testable. Nor can it be well modeled as the models run hot. So the alarm about ‘certain’ future SLR acceleration is completely overwhelmed by real observational uncertainty. Hence the last comments of the post are IMO the most important. It doesn’t need to merely ‘accelerate’ in order to meet the alarmist estimates by the end of the century it positively needs to become more supercharged than an elon musk rocket. Its difficult to see where this exponential rise in sea level is going to come from. The acceleration would be coming from Antarctica and Greenland melting. They are combining to contribute ~1 mm/yr now and were contributing very little at the beginning of the 90’s when these measurements started, so that alone explains much of the acceleration, but this is more a topic for the next part where recent measurements are addressed. Satellite measurements apply to not only sea level but the glacier mass loss in those areas which is an increasingly important part of the budget and may start to dominate sea-level rise in only a decade or so because that part of the rate appears to be growing exponentially. Jim D, according to Zwally based on IceSat Antarctica is not losing, and may be gaining, ice mass. And after diff GPS observational GIA became available for Antarctica (showing previos modeled GIA was about 4x too high—see Climate Audit for details) recalculating GRACE for Antarctica showed fairly food agreement to IceSat. You got NOTHING observationally. Tony, of course you are correct. That is why the ‘tipping point’ meme has been so important to warmunists. Hope I debunked that in guest posts Tipping Points and Totten Glacier. Zwally’s estimate is out of kilter with sea-level budgets and all the other studies of this. Most estimates put the net loss at ~100 Gt/yr, about one third of Greenland’s, where the biggest loss is occurring. Take an alarmist paper, replace “might” with “will”, and you can publish in the Scientific American. Dr. Curry ==> The PSMSL folks have an international program to couple Tide Gauges with CORS-like permanent same-structure continuously operating GPS stations- which are required to make Tide Gauges useful in determining GMSL. Their interim plan, to use any GPS stations within 15 km (I think) is only “better than nothing” and allows at least, in most cases, to correct for continental vertical land movement (VLM), but does not account for vertical movement of the structure to which the Tide Gauge is actually attached, which means that all VLM attributable to local subsidence looks like SLR at the gauge. NGS CORS has found in almost all cases, VLM at same-structure locations is of the same magnitude as measured SL change. Thus, until there are a sufficient number of Tide Gauges matched to same-structure CORS stations, the tide gauge data is suitable ONLY for determining Relative Local SL change. Scientists should know better than to confuse acceleration with rate of acceleration, with nobody measuring the latter despite its common word use. Also note that acceleration can happen and can be calculated when a time gauge is on land that is rising or falling, provided the rate of rise or fall is constant. When seeking evidence of acceleration, one should not reject stations with vertical motion known plausibly. Geologically, I suspect that there is too little observational evidence to allow generalisation about sudden change or gradual change in vertical level. Both have been observed. So generalisation should be replaced by measurement. Thanks Judith! Are you going to talk about the cause of the sea level reversal from the LIA? I look forward to the satellites. The Topex/Jason show around 3mm or more every year including the GIA correction. That is fine if you would calculate the amount of water in the oceans, but works not to evaluate coastal Sea level. In fact you could argue that you should subtract 3 times the GIA from the satellite measured level, because if the seabed sinks 0.3mm then the land should raise 1mm, because the Earth has the same volume. Fascinating as always, Judith – thanks for all that you do. I’ll try to start working on this today. Part IV and V are the punchlines (V will deal with attribution issue). I think I have a donor lined up who will support my assessment type research, which means i will have more time for this kind of thing. This study established a geodetic formulary to synthesize a regional absolute sea level rise from a cluster of tide gauge measurements together with local vertical crustal movements observed at nearly located GPS stations, and model predicted regional Glacial Isostatic Adjustment (GIA). The formulary also enables estimation of local vertical crustal motions at tide gauge stations that are not monitored by collocated GPS stations. As a demonstration, the regional absolute sea level velocity was synthesized using the estimated relative sea level trends at four tide gauge stations in the states of Maryland and New York along the East Coast of the United States in conjunction with two geocentric GPS time series that provided the geocentric vertical crustal rates near these tide gauges, and the model predicted regional vertical motion of GIA origin. The results reveal an accurate regional absolute sea level rise of 2.19±0.26 mm/yr bordering Western Atlantic Ocean. Abstract. Thirteen years of GRACE data provide an excellent picture of the current mass changes of Greenland and Antarctica, with mass loss in the GRACE period 2002-15 amounting to 265±25 GT/yr for Greenland (including peripheral ice caps), and 95±50 GT/year for Antarctica, corresponding to 0.72 mm/year and 0.26 mm/year average global sea level change. A significant acceleration in mass loss rate is found, especially for Antarctica, while Greenland mass loss, after a corresponding acceleration period, and a record mass loss in the summer of 2012, has seen a slight decrease in short-term mass loss trend. The yearly mass balance estimates, based on pointmass inversion methods, have relatively large errors, both due to uncertainties in the glacial isostatic adjustment (GIA) processes, especially for Antarctica, leakage from unmodelled ocean mass changes, and (for Greenland) difficulties in separating mass signals from the Greenland ice sheet and the adjacent Canadian ice caps. The limited resolution of GRACE affects the uncertainty of total mass loss to a smaller degree; we illustrate the “real” sources of mass changes by including satellite altimetry elevation change results in a joint inversion with GRACE, showing that mass change occurs primarily associated with major outlet glaciers, as well as a narrow coastal band. For Antarctica the primary changes are associated with the major outlet glaciers in West Antarctica (Pine Island and Thwaites glacier systems), as well as on the Antarctic Peninsula, where major glacier accelerations have been observed after the 2002 collapse of the Larsen B Ice Shelf. Abstract. Ice discharge from large ice sheets plays a direct role in determining rates of sea-level rise. We map present-day Antarctic-wide surface velocities using Landsat 7 and 8 imagery spanning 2013–2015 and compare to earlier estimates derived from synthetic aperture radar, revealing heterogeneous changes in ice flow since ∼ 2008. The new mapping provides complete coastal and inland coverage of ice velocity north of 82.4° S with a mean error of < 10 m yr−1, resulting from multiple overlapping image pairs acquired during the daylight period. Using an optimized flux gate, ice discharge from Antarctica is 1929 ± 40 Gigatons per year (Gt yr−1) in 2015, an increase of 36 ± 15 Gt yr−1 from the time of the radar mapping. Flow accelerations across the grounding lines of West Antarctica's Amundsen Sea Embayment, Getz Ice Shelf and Marguerite Bay on the western Antarctic Peninsula, account for 88 % of this increase. In contrast, glaciers draining the East Antarctic Ice Sheet have been remarkably constant over the period of observation. Including modeled rates of snow accumulation and basal melt, the Antarctic ice sheet lost ice at an average rate of 183 ± 94 Gt yr−1 between 2008 and 2015. The modest increase in ice discharge over the past 7 years is contrasted by high rates of ice sheet mass loss and distinct spatial patters of elevation lowering. The West Antarctic Ice Sheet is experiencing high rates of mass loss and displays distinct patterns of elevation lowering that point to a dynamic imbalance. We find modest increase in ice discharge over the past 7 years, which suggests that the recent pattern of mass loss in Antarctica is part of a longer-term phase of enhanced glacier flow initiated in the decades leading up to the first continent-wide radar mapping of ice flow. Let’s do a little thought experiment in logic. West Antarctica has been found inherently unstable with evidence of deglaciation going back 1500 years. East Antarctica glaciers drainage remarkably constant. East Antarctica has not been found to have extensive geothermal activity. West Antarctica has massive evidence of geothermal activity. Geothermal activity can affect basal melt dynamics through increased lubrication and enhanced flow of subglacial streams. Is it any wonder that the Ice Sheet without geothermal activity is remarkably stable and the Ice Sheet that has increased ice discharge has vast evidence of geothermal activity? Logic is a wonderful thing. Not when it is full of holes. So if Zwally is right the sea level changes are due to other causes JCH. Sea levels than the salt pan technology in the Mediterranean. Pingback: Weekly Climate and Energy News Roundup #304 | Watts Up With That? The AMOC is said to have a big influence on sea level on much of the east coast of North America. The new AMO mostly just hangs around aping the changes in the GMST. My personal prejudice: Scientists who publish a paper refining some estimate of SLR and then conclude by explaining how their work “closes the sea level rise budget” are working in ignorance of confirmation bias. The amounts of SLR, GIA, steric expansion, ice cap melting and other factors are subject to individual uncertainty, cumulative uncertainty and continuous revision. Any summary written when a paper is published likely to be obsolete within a few years. One’s work on any of these subjects needs to stand alone. I suspect those who don’t bother to discuss closing the budget while refining some aspect of that budget are more likely to be reliable. To paraphrase “all politics is local,” in the end isn’t the effect of seal level local? It makes no difference to New Orleans what is happening to MSL (whatever that is) if your land is sinking relative to sea level. The folks who live in southern Louisiana need to “do something.” I gather the population of Miami also needs to make some adjustments — like maybe not building streets and buildings below the level of the “king tide.” These places, and many more around the world where sea level relative to the land is rising shouldn’t be waiting for science to someday agree on what’s happening to MSL. In the USA, it would also help if the government stopped subsidizing building in flood plains and areas subject to destruction from storm surges.